Games are a powerful force in the lives of many. They helped me socialize with others and become a more optimistic person. They encouraged me to be creative and experiment with technology. But games can also reinforce stereotypes about people who don't fit cultural norms. As I grew older, I began to think about ways I could help erase racism and sexism from games. I wanted to stop consuming regurgitated fantasies and instead tell my own stories, and so over the past two years or so, I began learning to make my own games. Along the way, I've learned that even small efforts in unexpected areas can make an enormous difference. Although my goal as a game-maker is to create works that help people understand one another and feel less alone, I’ve actually learned the most about making a difference through the development of Prism Shell, a sci-fi action game about shooting alien hordes. In 2013 my friends Chris Algoo, Dennis Liaw and I committed to participate in as many game jams as we could, to learn more about game development. In October, we joined over 100 other participants to attend my fourth hackathon-style event backed by Samsung and Tizen, hosted at a famous design agency. We had 24 hours to make a game, and Chris had come up with an innovative mobile game mechanic. His idea was to place points on the screen that attracted the player's character, forcing it to move and stick to each node. By constraining player movements and by creating enemies that chase them, exciting interactions could occur. From this exciting focus on minimal movement, we began to throw around ideas, and I began to think about the character that would represent our project. As a woman who grew up playing video games, I was used to seeing mostly white women characters in skimpy outfits that had little to do with the jobs they had. The few women of African and Indigenous American ancestries I remember were scantily clad in “tribal wear”. I knew this was a chance to make a change. Could our character be a woman? Could she be a woman of color, could she wear sensible clothes? Our game was going to be called Prism Shell, and it would be set in space. So I took inspiration from Alien, a movie that, famously, was going to star a male actor before Sigourney Weaver took the role. Our main character would be a Major General in the Earth Navy, and we named her Beretta. She had blue hair and tan skin; she wore black lipstick, a bullet-proof vest over a military jumpsuit, and shoes fit for running while in combat. I proudly shared Beretta's design with my friends and family on Facebook. Once a fully-colored version of her design was done, I tweeted about her. I was excited to have her represent a game I was working on. With only 24 hours to finish the game, we had to prioritize the art and mechanics. We all agreed that a story could wait -- but where would Beretta fit in? With our tiny budget, we had to accept we might only see her on the title, win and lose screens. I hoped those brief appearances would be enough to engage players with the person inside the tank. When Prism Shell took second place at the hackathon, we were elated: We split the prize money amongst ourselves, incorporated together as the Brooklyn Gamery, and prepared to continue working on the game, planned for a launch on Tizen’s operating system. When Samsung ultimately delayed the launch of its first phone running Tizen, we were devastated, but continued working on the game anyway. If we couldn't release on Tizen, we would be able to aim elsewhere. We refocused our attention on releasing the game for Android and iOS. We brought the Android version of Prism Shell to local industry events including IndieCade East and Playcrafting NYC. Both times, we prominently displayed the game's title screen with Beretta's portrait and prepared playable versions of the game on our phones. People of all ages and genders were attracted to the game. An older woman remarked that the game was easy to play, even for someone like her. We knew part of the game's attractiveness was due to our unusual character, as well as the fact that Prism Shell was designed speifically to be mobile-friendly. A year passed since that initial version of Prism Shell, and in that time, I matured as an artist and became aware of many biases within myself. I decided to re-examine Beretta, and implement some re-designs. The original Beretta was olive-skinned with yellow-green eyes and a sharp nose—she was racially ambiguous. The new Beretta was clearly Black, with brown skin and a rounder, more defined nose. We kept the old eye color, though, because we thought it was more visually striking and futuristic-looking. I tweeted a comparison image in the hopes that people would notice. Positive feedback flooded in: people loved the new Beretta! But we hardly had any place to show her in the game. Over the course of a year, the game’s concept ballooned to include a story mode, multiple tanks, and in-app purchases—then shrank because development was taking too long, and one member departed the company. We had refocused our efforts on turning Prism Shell into an endless survival game. There was no longer space for a story, and Beretta was again relegated to the title screen. We hoped that even if she was only on one screen in the game, people would still assume she was piloting the ship. As we learned from showing the game at local events, even a small appearance can make a difference. We recently launched Prism Shell for Android, iOS, and Windows. We will also launch the game on other platforms very soon. As always, Beretta is featured on the game’s home screen, and in all of our marketing materials. Our efforts have been positively received by people at recent events and in the media. Overall, Brooklyn Gamery is proud to have created Beretta. Over the past two years, we learned a lot about our own biases as well as how to embrace diversity and use our own experiences to make positive change. We plan to continue creating diverse characters for future games. We think our experience can serve as an example of how, even when your game isn’t story or character-driven, attention to the way you draw and imagine your worlds and the people in them can make an enormous difference. Creating characters from diverse backgrounds can invite, include and intrigue people who don’t often see themselves represented, and can make your work stand out to people who are used to the industry’s misleading “defaults”. 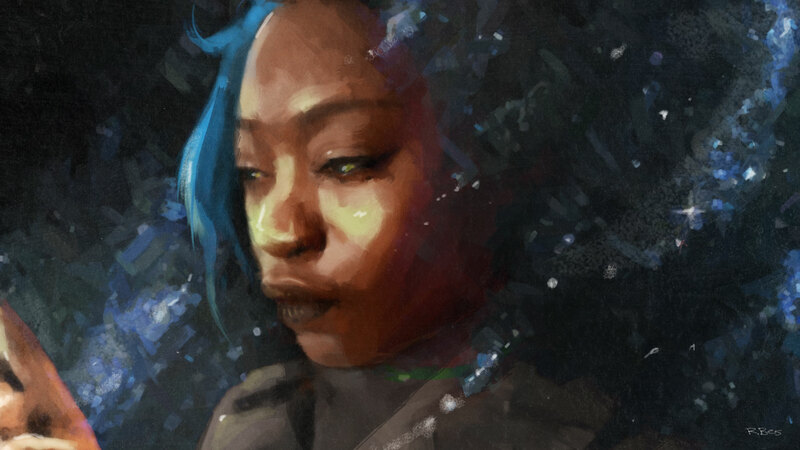 Even if you don't see color, others do, and we all have a hand in making games more inclusive.